Come and enjoy Portugal as it was intended. Take in the scenery, eat the fresh seafood and enjoy the fine wines of Portugal. It’s distinguished by dramatic beaches separated by dramatic cliffs, untouched landscapes and a raw Atlantic essence is hard to find elsewhere. Apart from the miles of beaches, there are also a lot of quaint villages, blissful coastal cities and vast natural parks. Located close to Lisbon, this is a perfect holiday, easy to get to - yet remote enough to give you the feeling of “getting away from it all”. Using old walking trails that connect each town, you will discover the dramatic coastline scenery and feel the cool ocean breezes throughout the walk. 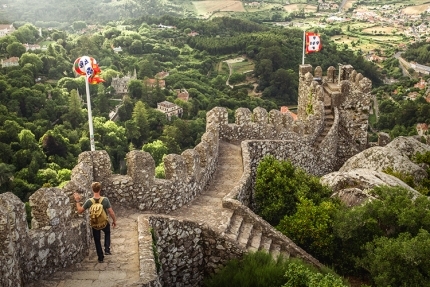 Then walk inland to the remarkable town of Sintra with its dominating ancient castle, a UNESCO World Heritage site. Sintra is a picturesque town that is set amidst the pine-covered hills of the Serra de Sintra. This hilly and slightly cooler climate enticed the nobility and elite of Portugal, who constructed exquisite palaces, extravagant mansions and decorative gardens. The variety of fascinating historic buildings and beautiful scenery makes Sintra a fantastic place to end your walking trip.